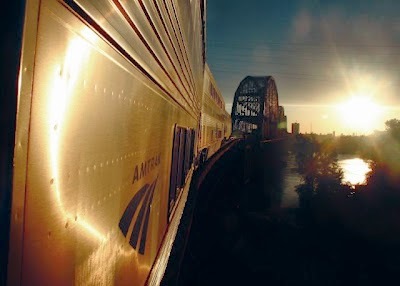 The Sunset Limited bound from Los Angeles to New Orleans, was listed to stop at 5:12pm, Friday, but did not pass through Lafayette -- 140 miles out from NOLa -- until 1:30 Saturday morning. It was well into the next day when it finally reached the City of Dreamy Dreams, our Big Swamp City, New Orleans! The sun was rising when we stepped out of Union Passenger Terminal on Loyola Avenue, next to the Superdome, and climbed in a United Cab headed for a French colonial breakfast of beignets and café au lait at Café du Monde, next to the Riverfront flood wall. Our cab driver nodded but said nothing. We had seen him before. And he had seen us. 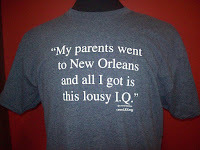 He was wearing his T-shirt that read: "My Parents Went to New Orleans and All I Got Is This Lousy I.Q." We did not know what that meant, because the only part of the "what-ever incident" that concerned us was Amtrak's delay. "If that isn't an Amtrak-incident," Norma bellowed, "Ray Nagin is an honest man." The cabbie pulled up to the curb and turned around and stared at her. Since Katrina, The T-P has been pushing her faithful scribes out the door. Now, she is pushing them out windows, too, and breaking our hearts all over again with news of more lashes from the Demon Change. "Thank Gott, we have a flood wall sturdy as the one that failed last time," L. A. Norma told the checkout clerk at Rouses on Baronne Street. We phoned for our cabby and told him during the ride to the station that Italy was playing in the European Cup. The game would be on TV, "In forty-feet-up, twenty-miles-in Lafayette," L. A. Norma said. Hemingway's Pamplona-NOLa running-of-the-bulls party on Frenchmen Street," Norma said to the ticket-taker at the Sunset Limited's platform gate. The ticket-taker closed her eyes and handed us back our ticket stubs. We closed the curtains and dozed off as the train slipped out past the Arena and the Superdome. Contact me if you want on the list - that may get e-mailed. If you wish to read any month's column go to www.LEJ.org anytime. They are posted on the first of each month and polished for the next few weeks.